Yesterday, I blogged about how journeying into the local supermarket has been a different experience, causing me to reflect upon my usual dinner staples and realize I have to learn new things. 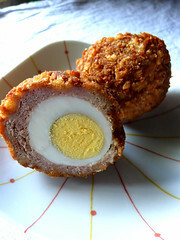 I did figure out what exactly a Scotch Egg is and bought some more for tomorrow’s breakfast, as we’re all a bit intrigued. I also learned that the big, almost roast-like cuts of bacon are for boiling whole, which makes more sense than trying to slice it thin at home then frying it. And I may have found where the green onions are, though they were called salad onions and they were larger than expected. I had no time to investigate as Maura was loose with a shopping cart and we all can imagine how that could go. But it’s more than brands and leeks and weird cuts of bacon. It’s that everything is metric or Celsius. Meat comes in grams, not pounds. Actually, most things do. The only familiar thing is the 2 litre of Coke. Even chips come packaged differently – instead of a whole bag to stick your face in feed-bag style, they come in individual packets. I find myself staring at a package of stew meat and trying to gauge from sight if it’ll be enough for dinner. Then there’s getting it all home. Half the time, I’ve walked up to the store with at least one off-spring. I prefer Sean, because he can carry a lot. Maura…well, she’s willing but she’ll drag the bag. You can only heft so many gallons of liquids home at one time. So I’m buying less at the store. In retrospect, it’s probably a good thing – you buy less if you have to carry it. Not that I’ve seen a ton of bulk items. Tea – you can buy a lot of tea at once. Once home, I have to figure out things like appliances, and what to cook it all in or on, as we’re still in the temporary house. Oh, the kitchen has enough to get by. Lots of wine glasses. But I never realized how much I used cookie sheets until I’ve lived without them. I also miss my tongs for flipping things as they broil. I’ve finally figured out the oven pretty well – which is in Celsius, so the temperature only goes up to 220 degrees. I have to say, that was a bit confusing the first time I tried to cook something. And if the agent hadn’t shown me which setting was for baking, I’d probably still be looking for it – it’s the fan symbol. Makes sense, right? Don’t ask me what any of the settings are on the microwave – it was on the bowl with lid, four squiggly lines drawing (opposed to bowl with lid with less squiggles, and bowl without lid plus squiggles.) There are no words on any of the cooking appliances. No High, Low, Defrost. My theory is that these appliances are made in one country, sold to many across Europe. It’s just easier to have them without wording than to have to translate several. I have to say – the coolest appliance is the electric tea kettle. Josh thought it was the coffee pot at first. But you fill it with water, click the switch up, it heats up water in like 30 seconds and automatically flicks the switch off when it’s done boiling the water. Miriam and I have decided that once we get settled, we need to get one of these things! Did I mention the microwave has dials? Josh told Sean to cook something for 30 seconds and Sean said “How?” Yep, everything make look right, but it’s taken a little adjustment.